63% of women transport workers have recently suffered violence at work. More than a quarter believe that harassment is an unavoidable part of the job. But violence at work is not inevitable. As we mark the UN Day for the Elimination of Violence against Women on 25 November, it is time to take action. The Executive Committee of the European Transport Workers’ Federation has adopted a strong statement. 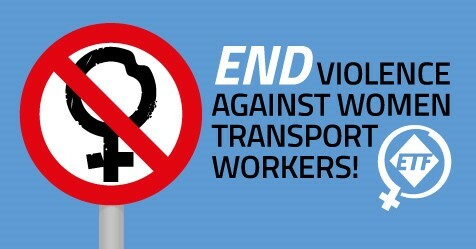 They call on ETF affiliate unions, European governments and EU institutions to tackle the shocking violence and harassment faced by women in the transport sector. The scale of the problem is revealed in a new supplementary report following the ETF study Violence against Women at Work in Transport. This now includes extensive personal testimonies from women transport workers across Europe who have faced violence and harassment from customers, colleagues and managers. The stories are distressing, especially when many women workers describe this harassment as a “weekly” or even “daily” occurrence. Trade unions must do more to support women transport workers and put the issue at the heart of their campaigns. The EU should undertake a larger survey, the findings of which could serve as a basis for future legal proposals. The ETF also calls for the EU’s new Platform for Change – Women in Transport to make the fight against gender-based occupational violence a priority.